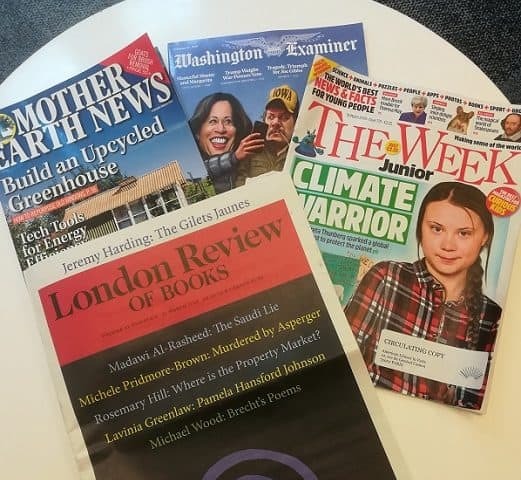 The Library is now subscribed to a couple of new magazines with a wide range of topics – environment, politics, news for children and book reviews. 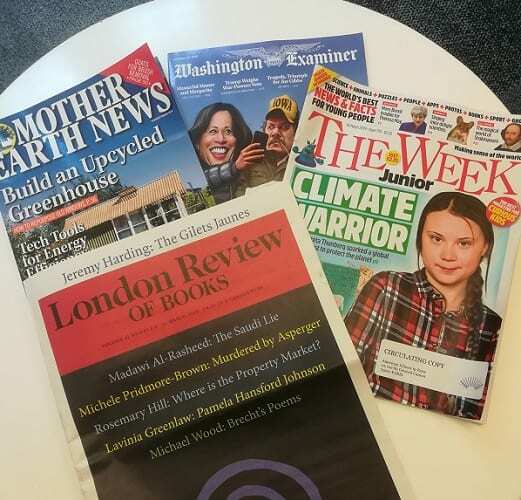 New titles on the shelves are London Review of Books, Mother Earth News, The Washington Examiner and The Week Junior. London Review of Books is a British journal of literary essays founded in 1979 and published twice a month. Our readers can enjoy book reviews, reportages, poems, reviews of exhibitions and movies, letters and a diary in this Europe’s leading magazine of culture and ideas. Mother Earth News is an American bi-monthly sustainable-lifestyle magazine promoting renewable energy, recycling, family farms, better eating habits, natural health, and affordable housing. This magazine is perfect for people who want to approach environmental problems from a practical, how-to standpoint. The Washington Examiner is an American weekly magazine that covers US and international political news. This magazine, which merged with The Weekly Standard in January 2019, is known for its conservative political stance and features many prominent conservative writers. Our youngest Library members can get informed about European and international news with our new current affairs magazine The Week Junior. This magazine is wonderful source of information for children aged 8 and 14 because it’s filled with fascinating stories and information written to engage curious young minds. Find these, and other magazine titles, in the Members Lounge of the Library where you can enjoy reading them in our comfortable chairs.